A taxi cab driver is in stable condition after he was robbed and shot in Miami Tuesday morning, police said. The incident happened shortly before 5 a.m. in the 1900 block of Northwest 18th Terrace, Miami Police spokeswoman Kenia Reyes said. The man, who identified himself as Samson Ojo, said he had responded to a call for a taxi and was approached by a woman. Samson Ojo says he thought he was picking up a fare when he was robbed and shot in Miami by a man and woman. He speaks with reporters after his release from the hospital. Daughter Sheree Ojo also comments. While he was speaking with the woman, an armed man in a grey hooded sweatshirt approached the car and demanded money. Ojo said he gave the man all his money, about $30, but when the suspect tried to take his taxi, he resisted and drove away. That's when he was shot, he said. “I drove to get away from him and like boom, through the back window and hit me in the back," Ojo said. 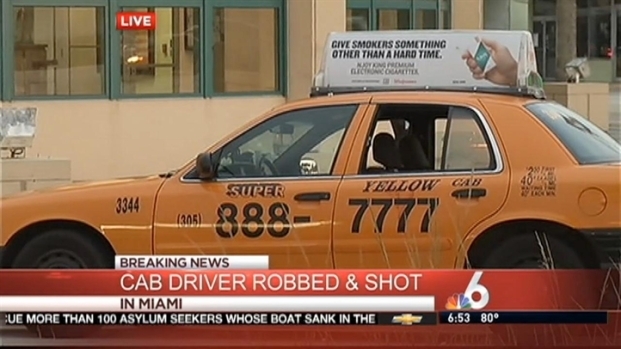 A taxi driver was hospitalized in stable condition after he was robbed and shot in Miami Tuesday morning. The man and woman fled the scene, police said. Ojo drove himself to the Miami Police Department's South District Substation at 2200 West Flagler Street, Reyes said. He was taken to Jackson Memorial Hospital's Ryder Trauma Center in stable condition with a single gunshot wound, Reyes said. Ojo was later released and was wheeled out of the hospital by his daughter in a wheelchair. "How can you be so heartless? This is a man that's trying to support his family and you can just try to take another person's life?" daughter Sheree Ojo said. "When we catch the person or if we ever do catch the person, I hope they go to jail." His daughter said it was the ninth time he's been robbed since working as a taxi driver. Police are still looking for the suspects. Outside of the hospital, Samson Ojo described what he was thinking about while he was driving toward the police station. "My kids, my ex-wife and uh ..." he said, pausing. "It's OK," he said, crying.